NEW DELHI — One man came from privileged beginnings and went to all the right schools, the other was the son of a tea-seller. 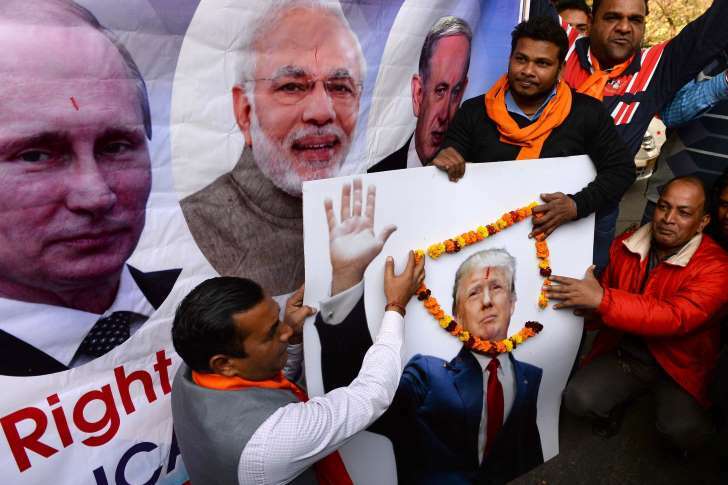 Yet both India’s Prime Minister Narendra Modi and Donald J. Trump rose to power as populist outsiders willing to disrupt entrenched power systems in their respective capitals. The two men men spoke Tuesday, their first interaction since a brief congratulatory phone call after Trump’s election in November. In a summary of the call, the White House said Trump called India a “true friend and partner” and the two had discussed the economy, defense and the fight against global terror. Trump said he looked forward to hosting Modi in a visit later this year, and Modi returned the favor after the “warm conversation” in a tweet Wednesday morning. 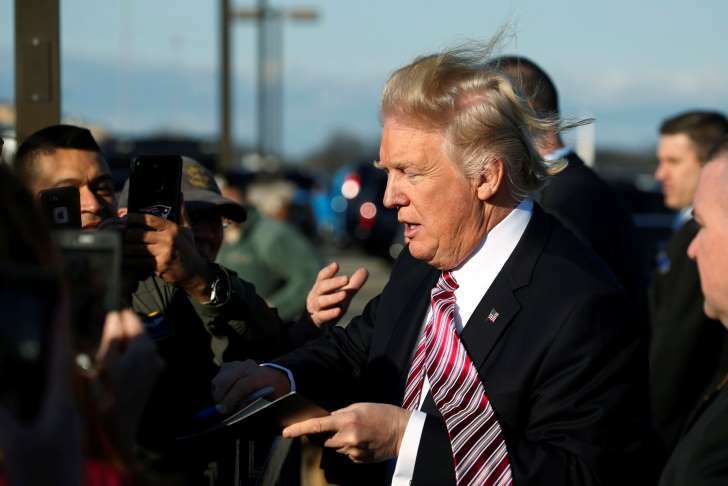 But he also mimicked the accent of India’s call center workers, vowed to keep American jobs in the United States and criticized the H-1B high-skilled worker visa program, worrying the Indian tech industry. The Trump Organization is also involved in at least four real estate projects here, valued at an estimated $1.5 billion. The two men are likely to find common ground going forward on terror and security, particularly in regard to the terror threat from neighboring Pakistan, experts said. Judging from Tuesday's telephone call, “clearly terrorism was front and center,” Vaishnav said. In his inaugural address, Trump pledged to stamp out Islamic terrorism around the world. But he earlier engaged in a chummy telephone call with Pakistan’s Prime Minister Nawaz Sharif — calling him a “terrific guy” who does “amazing work” — which also troubled Indian officials. Modi, 66, has long been associated with the Hindu nationalist movement, Rashtriya Swayamsevak Sangh, and for a time was denied a U.S. visa for failing to stop anti-Muslim riots while serving as a state chief minister. His supporters in the Hindu right have stoked nationalistic fervor in the country — at times with violent results — and last year India became immersed in a debate over patriotism and free speech after protests on college campuses. Most recently, the Supreme Court mandated that movie-goers must stand as the national anthem plays before films. © REUTERS/Jonathan Ernst U.S. President Donald Trump signs autographs for onlookers as he arrives aboard Air Force One at Joint Base Andrews, Maryland, U.S. January 26, 2017. WASHINGTON (Reuters) - U.S. President Donald Trump wants a new 20 percent tax on all imports from Mexico to pay for a wall on the southern U.S. border, White House spokesman Sean Spicer told reporters on Thursday. BANJUL, Gambia — Gambia's President Adama Barrow finally returned home Thursday, solidifying his position as this country's first new commander in chief in two decades after a political crisis that sent the previous ruler into exile. Hundreds of people lined the road to the airport ahead of his arrival, while boys on top of packed minibuses played drums on empty gas canisters and women danced in joy. Hundreds more gathered at the airport, where Barrow emerged from the plane in a flowing white robe to shouts of "Welcome! Welcome!" He moved slowly along the red carpet, greeting people amid heavy security. "Every Gambian must be free. We suffered for 22 years, but now enough is enough," said Seedia Badjie, 37. Gambians had eagerly awaited Barrow, who has promised to reverse many of the authoritarian policies of former leader Yahya Jammeh, who was accused of imprisoning, torturing and killing his political opponents. Barrow defeated Jammeh in December elections, but the veteran leader did not want to cede power. The international community, alarmed by Jammeh's unpredictability and claims that included a bananas-and-herbal-rub "cure" for AIDS, threw its support behind Barrow, a 51-year-old businessman. 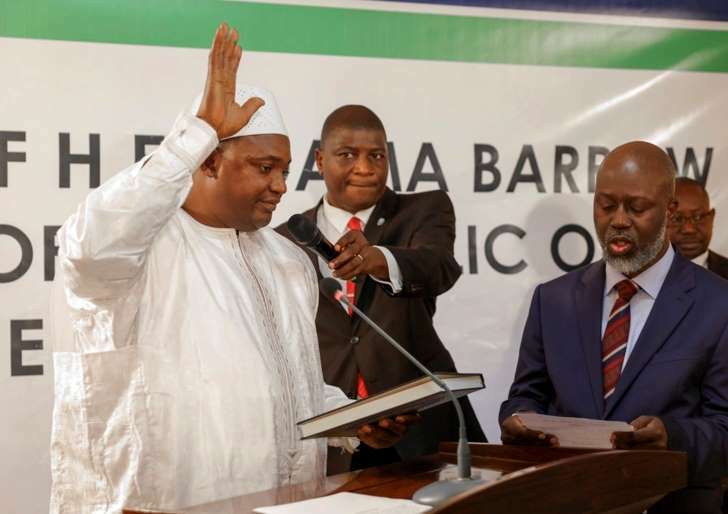 Barrow was sworn into office on Jan. 19 at the Gambian Embassy in neighboring Senegal because of security threats as the standoff continued. 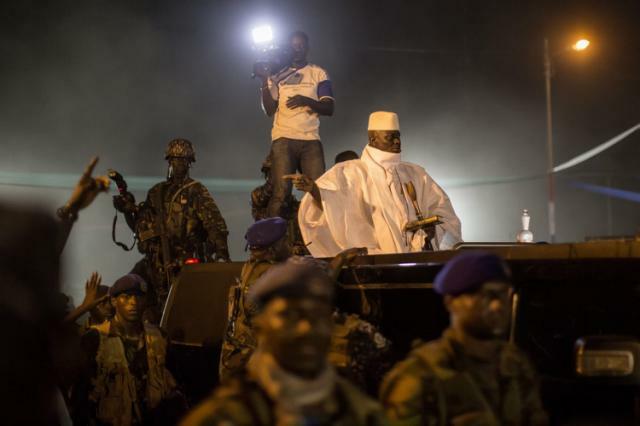 Jammeh finally left Gambia last weekend, bowing to international pressure that included a regional military force, ending a more than 22-year rule. The West African troops were poised to oust Jammeh if diplomatic talks failed. They have spent recent days securing the country for Barrow's arrival. A larger, more formal ceremony to welcome Barrow home will take place at a later date, spokesman Halifa Sallah said. About 2,500 of the ECOWAS troops remained in Gambia — in the capital, Banjul, as well as at key crossing points between Gambia and Senegal and at the port and airport, according to Sweden's U.N. Ambassador Olof Skoog, the current U.N. Security Council president. Barrow has asked the troops to stay for six months to provide security, said Mohamed Ibn Chambas, special representative of the U.N. secretary-general and head of the U.N. Office for West Africa and the Sahel. Gambia, with nearly 1.9 million people, has become an example in West Africa as the region strives for stable, democratic changes of power. The world watched as Gambians showed they wanted change, supporting a coalition of opposition parties whose aim was to oust Jammeh and put the country on a path toward greater freedoms. Jammeh has ended up in Equatorial Guinea, taking luxury cars and other riches amassed during his presidency and accompanied by trusted family and security guards. When Jammeh left, the streets in Banjul exploded in celebration, with music blaring from speakers and people dancing in the streets. The new president is faced with immediate challenges, including a government that appears to be broke. Jammeh left the state coffers empty, the new leader has said. Gambia's biggest export is peanuts, though the country, the smallest on Africa's mainland, also has become a significant source of migrants making their way to Europe. Barrow's months ahead will be crucial to building a country that can put a climate of fear behind it and work toward reconciliation. He has vowed greater freedoms and reforms to the security forces and the constitution. Barrow already has named a female vice president, Fatoumata Tambajang, who has called for Jammeh's prosecution for alleged human rights abuses. But it emerged that she might be above the constitutional age limit for the post, and Barrow said he will form a vetting committee for further appointments. Sallah, the spokesman, said a human rights commission will be set up and the new government will create a freedom of information act. "We expect a lot of things from Barrow," said 26-year-old Modou Fall, who, like many others, wore a #Gambiahasdecided T-shirt to show support for the new president. "We want the forces to stay so that we can reform our army ... and we need development in this country." Georges Leekens tapped into more than 30 years in the dugout to warn his players about the dangers of taking on so-called "underdogs". Leekens, 67, leads Algeria into the 2017 Cup of Nations seeking their second title. They face Zimbabwe in their opening game in Group B on Sunday in Franceville. Algeria, according to the Fifa rankings, should beat Zimbabwe. There are more than 60 places between the countries. But Leekens, who started his coaching career in 1984 with Cercle Brugge in Belgium, said he ignored such prognostics. CAN 2017 - WHAT MATCHES ARE WHERE? "I view our game against Zimbabwe as a tough challenge. We need to apply our minds 100 percent to how we are going to conquer Zimbabwe. Group B has been reduced to a three way fight between Senegal – the current top ranked African team - Tunisia and Algeria, who are rated fourth and fifth respectively. Zimbabwe, who are 30th in the lists, had an unsettled prelude to the event in Gabon. The players and the Zimbabwe Football Association rowed over fees and bonuses for appearing at the tournament for the first time in 11 years. Algeria enter the tournament with their own set of formidable weapons. Riyad Mahrez was anointed African footballer of the year just before the Cup of Nations for his stellar performances with Leicester City as they defied the odds to win the English Premier League title in 2016. 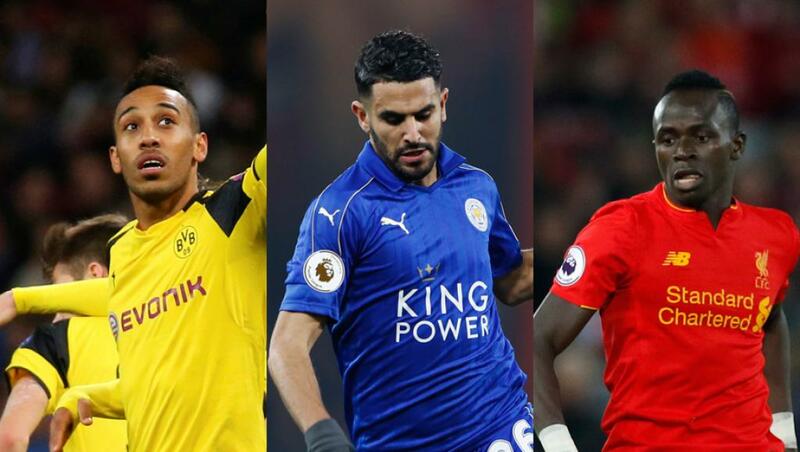 Mahrez, 25, was born in France but opted for the land of his father and he will be one of the keys to Algerian success along with his Leicester City teammate Islam Slimani.